With G hook and green yarn chain 77 (90), leaving at least a 9 inch tail. Join chain with a slipstitch (be careful not to twist). Round 1-3: Ch 1, *sc in next 5 stitches, 3 single crochet in next stitch, sc in next 5 stitches, skip 2 stitches* repeat from * around. Round 4-10: Switch to H hook and pink yarn, *sc in next 5 stitches, 3 single crochet in next stitch, sc in next 5 stitches, skip 2 stitches* repeat from * around. Round 11-14 (11-17): Switch to I hook, *sc in next 5 stitches, 3 single crochet in next stitch, sc in next 5 stitches, skip 2 stitches* repeat from * around. Fasten off weave in ends. DO NOT sew the openings around the stem closed like you did on the bag. Round 1: Join green yarn with a sc in one of the points of round 1, sc in each remaining point. Round 2-4: Sc in each stitch. Fasten off and weave yarn in and out of last round and draw closed. Weave in ends. That is too darling for words! Mt Niece in Australia would LOVE this! Hello, I went through almost all your pattern and must say that you are one talented lady. 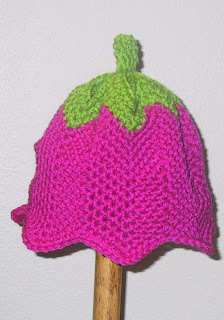 This tulip pattern is very very cute as a hat and as a bag too.I will surely make the bag.It is too cute. LOVE THE HAT. I JUST MADE A LITTLE OVER 100 HATS FOR ST. JUDE. The stem is worked in the points of round 1. It will make sense when you have the rest of it completed. My problem with the pattern was indeed my own oversight: watching TV and not focusing, I didn't do the second and third rows of green, so of course it didn't look like the photo. I have finished this impossibly cute little hat, and -- for those contemplating making it -- it is a fantastic pattern. Many thanks, again, Suzie for sharing your creativity. Oh, this pattern is so cute! I would love to make it for my grand daughter but she is just turning 1 year old. Is this hat for newborns only? There are two sizes, the larger one should fit kids up to about 8 years old. By adding a few more rounds you can make it fit even an older child. For your 1 year old the smaller size should fit. Hi, I can 't figure out the stem. it looks like there are going to be gaps when I sc in the points?? I live in Skagit Valley and Mount Vernon has a Tulip Festival every year...this is PERFECT! I made my daughter one in blue and now I'm thinking I need to start making more! It is very quick and easy, I had it finished in a night! I made this hat for my 3 year-old daughter. After measuring my daughter's head (16 inches) and reading your comment that the larger size would fit up to 8 years, I decided to make the smaller hat. My gage must have been off because the hat turned out tiny! It fits one of her bigger baby dolls, but I think even a newborn would grow out of it quickly. It's adorable, though, and I'm going to try again using the larger size. I might start with a bigger hook, too. Did you change hook sizes as you got to the instruction to do that? It makes a lot of difference in the size. Okay, I tried again. This time I started with my I hook and made my way to the K and I followed the instructions for the bigger size. I don't know what I'm doing wrong! I don't usually have gage problems. This one was better, but it's tight, like a beanie, so the "petals" don't flair out. Unfortunately, I made it in purple yarn, add that with the fact that it's so tight, and my husband says it looks like an eggplant! I'm so disappointed because yours is so cute. Erica, I'm sorry you are having problems with the size. I wish we were together and then I maybe I would be able to help you. I just don't know what to tell you. Are you using worsted weight? Do you join the rounds, or work in a continuous spiral? I've done it both ways. It doesn't seem to make much difference. If you join rounds pull the slipstitch tight so that it almost disappears. As I'm looking at the View from Above picture, that looks like way more than 3 rounds of green ... I must be doing something wrong! Look at the green part that is at 5 o'clock, you can barely see the opening and that there are only three rounds. When you work the stem it pulls them together making it look like more than three. Just keep going and you will be surprised how well it turns out. Hello! I've made tons of these hats for family, friends and charities. I would like to ask your permission to sell these hats for a fundraiser. I'm doing the Susan G. Komen 3-day breast cancer walk this year and I've been asked to make this hat to sell at our stand at the Skagit Valley Tulip Festival. All profits will go to our team for the walk. I already sell these hats in Skagit Valley, so I cannot grant permission for your fund raiser. Hi, stupid question here. Is this worked with a double strand, and about how much yarn did you use? I'm going to attempt to make an adult size with H, I, and J or possibly I, J and K hooks using SugarnCreme yarn. No it isn't worked with two strands. The medium fits most women. As far as making it with worsted weight cotton, it won't have the elasticity of acrylic or wool. I live in Northern Canada and was wondering if I may have permission to sell this tulip hat at our local farmer's market? I made one for my baby and it is just soooo cute! My question is if you know how to calculate the number of stitches in the chain for larger hats? I'm not sure what size yet but sometimes the number needs to be divisable by a certain number or whatnot. The medium fits most women. I think this is so cute. I make hats and donate them to the Arkansa Childrens Hospital. I would like to make sure it is ok to make these hats to donate. I think they will be a big hit with the children. Yes, you may make them to donate. I'm always happy for people to use my patterns for charity purposes. Bless you for your good works. 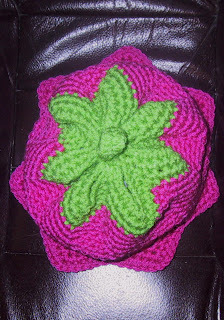 I love this pattern; I just made it yesterday and I'm using it to make other hats to donate for chemo patients. Thank you! The larger hooks might work. I have never tried making a larger one. The Tulip Bag is listed under Bags Totes and Purses. I think I would try it with bulky yarn or two stands of ww. So very cute! Are we suppose to be joining in rounds 1-3. And in round two I assume it should work out that we do the 3 sc in the middle of the former 3 sc? I didn't ch 1, worked in continuous rounds. I haven't crocheted one of these caps in years. Once I get my Christmas projects finished I will crochet one and see if I have the problem you are having. Hi Suzette, I finished the cocoon and it worked up nice. However, I am having problems closing up the top of hat. I have never started a hat from botton to top and am not sure what I am suppose to be doing. I guess it is the green portion in your photo. The decreasing is what I am not getting right peaks and dips??? The cap has opening even after working the stem. I still don't know how the stem is created. I've frogged the top of the hat about 6 times. My "leaves" also don't look like leaves after clinching the top. Help! Sorry you are having problems. I can't think of what to do to help you. Have you read the comments and answers? I just love this Pattern. I'm done with the sack. But having problems with the hat. I just can't figure it out. I think its because we kinda started in the middle. Mine isn't making any points like yours.I only have 6 points and I think you have 7.